Contributors to the Rotary Foundation are recognized as Paul Harris Fellows. 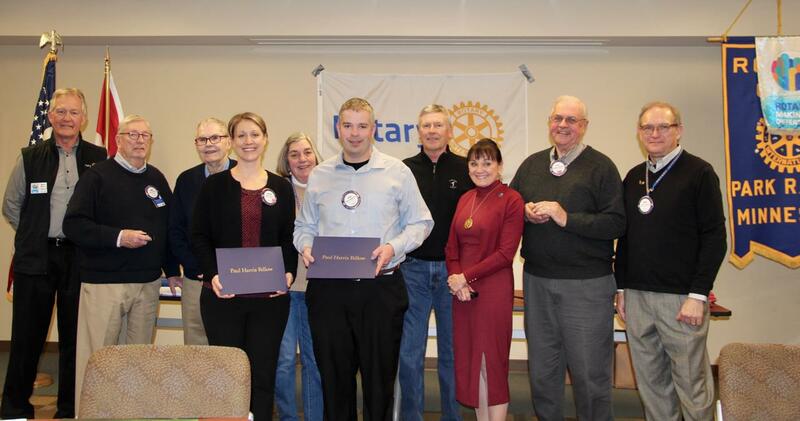 At Wednesday’s Park Rapids Rotary Club meeting, District Governor Deb Warner (front right), District Foundation Chair Keith Brokke (back left) of the Fargo-Moorhead AM Club and Club President Mark Larsen (back right) , presented the latest honor to seven club members. Recipients are (front, from left) John McKinney, Esther Simon, Ryan Mathisrud, (back) Lou Schultz, Plus One; Cynthia Jones, Plus Two; Jim Wallace, Plus One; and Clay Peterson, Plus One. Donors are honored for their contributions to the Foundation’s mission to enable Rotarians to advance world understanding, goodwill and peace through the improvement of health, support of education and alleviation of poverty.